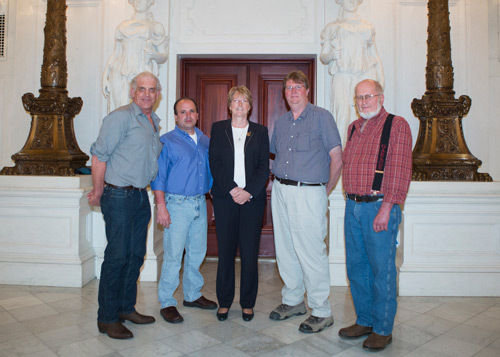 Rep. Kathy Rapp (R-Warren/Forest/McKean),was joined by several local tow truck company operators during a joint House Veterans Affairs and Emergency Preparedness Committee and Judiciary Committee hearing to examine the Pennsylvania State Police (PSP) Emergency Towing pilot program that began operating throughout portions of western Pennsylvania last fall. Pictured with Rapp in the state Capitol Rotunda, immediately following Wednesday’s hearing, (from left) are Robert Korbar, Johnson’s Tire Service, Tim Koebley, Koebley Towning and Recovery, Todd Rarey, Rarey’s Auto Service and Jim Dyke, Dyke’s Garage. HARRISBURG — On Wednesday, Rep. Kathy Rapp (R-Warren/Forest/McKean) was joined by several local tow truck company operators during a joint House Veterans Affairs and Emergency Preparedness Committee and Judiciary Committee hearing to examine the Pennsylvania State Police (PSP) Emergency Towing pilot program that began operating throughout portions of western Pennsylvania last fall. The program currently requires troopers to contact AutoReturn, a California-based service provider under contract by the state to dispatch participating towing companies to clear vehicles from accident scenes. The goal of the pilot program is to increase the safety of travelers and emergency crews and allow for travel lanes to more quickly re-open following an accident. Throughout Wednesday’s hearing, which lasted nearly five hours, Rapp extensively questioned several high-ranking members of the state police and AutoReturn CEO John Wicker, who all share direct oversight of the pilot program’s implementation in order to address the various concerns previously expressed to her by the local tow truck operators in attendance. “I am pleased that this hearing afforded the opportunity to ask many important questions about this pilot program and find out if the results are truly reflective of our citizens’ best interests,” said Rapp, a member of the House Veterans Affairs and Emergency Preparedness Committee. In addition to requesting details about the individual fees assessed for AutoReturn’s administrative services, Rapp asked questions regarding whether any specific towing companies have ever been removed or excluded from the towing operator list maintained by AutoReturn due to limited cell phone access in rural areas, and more specifically, if this is the reason why Warren County has yet to be included in the pilot program. Wicker indicated that the program is not structured to expand into new regions without reaching a certain enrollment threshold among operators in any particular area in order to ensure adequate coverage. He also confirmed that no towing operators meeting PSP requirements have ever been denied access to the pilot program.